A few days off and some sunshine has brought spring to North Antrim. On Sunday I seen my first butterfly of the year, a Small Tortoiseshell coxed out of hibernation by the rise in temperature. Nearby a Wheatear was hopping on the rocks stopping off before moving further north for the summer. On the cliffs the Fulmars are back in good numbers swooping and gliding effortlessly in updrafts, occasionally passing very close just to make sure you are not a predator. Just offshore the Eider courtship routine has begun with the males circling the females, throwing their heads back and uttering their far reaching cooing and crooning calls. 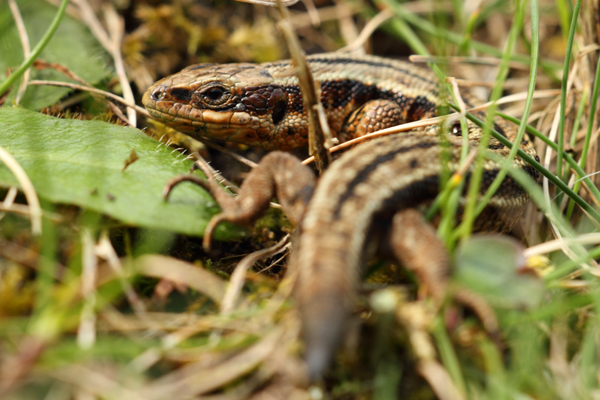 The true sign of things warming up in this part of the world is the emergence of Common Lizards. Every year I check out a few sites around here for these fantastic baby dinosaurs as my four year old calls them. The Common or Viviparious Lizard is the only native reptile in Ireland, and despite the name they aren’t especially common or often seen. These reptiles can live for up to 12 years growing up to 20cm long. They feed on insects, spiders, slugs, snails and earthworms: pouncing on their prey and stunning it by shaking before swallowing it whole. Lizards lack the ability to maintain their required body temperature and rely on the warmth of the sun to remain active, forcing them to hibernate through our winters. They give birth the live young (3-11) which hatch from their eggs inside the mother and the young are immediately self-sufficient. If you look carefully at the image opposite you may notice the tail being a different colour a sign that this lizard has survived an attack by shedding it’s tail and growing a new one. In order to escape. 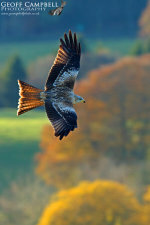 At this time of year they re-emerge and can be found sunning themselves on good days. The cliffs and dunes along North Antrim are a great place to look for them. It may take a while to find one, but well worth the effort.